You can enter to win $10 AutoZone Gift Card Sweepstakes, but you must be a US resident over 18 to enter this contest. 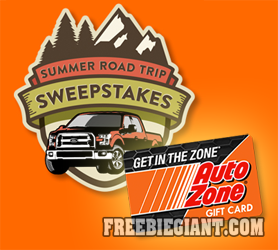 If you would like to enter the $10 AutoZone Gift Card Sweepstakes, simply click here to fill out the request form. You can enter daily and be one of 10,000 winners. You will also be automatically entered into the Finalist Prize drawing to win a trip to the Ecoboost 400 for a chance to win a Ford F-150! Ends July 27th, 2015.